What baby bath products to use? As a new mother, you will be swamped by information and tips on how to care for your baby. From cleaning your baby to putting them to sleep, every little thing matters. As adults, we are careful about the products we put on our skin, watching for adverse reactions, allergies, and toxins. Baby skin is much more delicate and sensitive, so the products you choose need to be mild and suitable. The ritual of bathing your baby is especially significant. One, because it’s a great bonding time between you and your baby. As you touch your baby and you look at each other, you create a unique connection. And second, because bath products can have a significant impact on your baby’s skin and hair. It is thus very important that you choose the right baby bath products for your little one. How to choose baby bath products? Supermarket shelves are full of baby bath products that come in fun bottles and tubes, and claim to be ‘extra gentle’ and ‘safe’. But how can you tell if they really are safe for your baby? Check the ingredients on the product, but don’t let the words fool you. Bath care products contain some chemicals and preservatives, but not all of them are bad for your baby. Compounds like 1,4-dioxane, for example, are used in minimal quantities, which can cause no harm to your baby. The same applies to some preservatives like formaldehyde. However, what is important is how much of preservative is in the product. JOHNSON’S® Baby products use no formaldehyde. Natural and essential oils are also part of the ingredients at times. Although they provide a nice fragrance to the bath water and to the baby’s skin, they can also act as an irritant and elicit an allergic reaction. In this case, natural is not necessarily better. What baby bath products are safe? 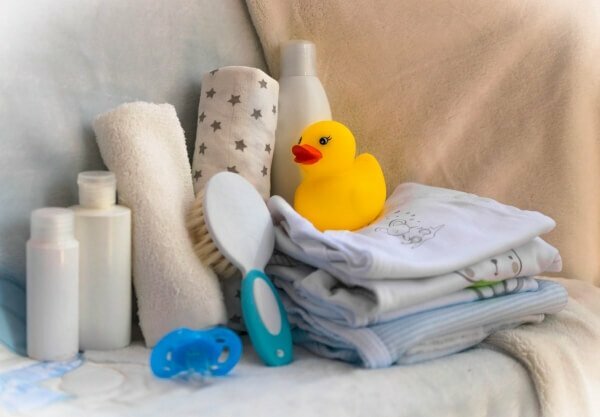 When bathing your baby, you do not need to use large quantities of product. Baby skin is soft and delicate, and a little bit is enough to keep them clean and fresh. However, since baby bath products come in direct contact with the skin on a daily basis, you need to be sure that they are not causing an adverse reaction and are actually caring for your precious one’s skin. JOHNSON'S® Extra Moisturizing HEAD-TO-TOE® Wash, for example, not only cleans your baby’s skin, but also moisturises it. Baby skin loses moisture twice as fast as adult skin, so it is important to replenish lost moisture during bath time. The product locks in the moisture for 24 hours, reducing the impact of dry, sensitive skin. If your baby needs soothing, then JOHNSON'S® Baby Fresh Bath is the product for you. Its gentle formula cools the skin and leaves it fresh for longer. The honeysuckle extract allows you to clean your baby without worry, and leaves your baby ready for the day. Another product that relieves skin is JOHNSON'S® Baby SOFTWASH. It comes enriched with moisturising baby lotion, which creates a rich lather to gently clean your baby, while also providing nourishment to her skin. If you are bathing your baby at night, getting them ready for bedtime, JOHNSON'S® Baby BEDTIME BATH is here to help your baby sleep better. The product contains NATURALCALM® essences — a special blend of gentle and calming aromas, that are gentle enough to use every day. The calming aromas, coupled with the gentle massaging action of bathing, soothes your baby and prepares her for a good night’s sleep. Free of phthalates, parabens, soap, and dye, all JOHNSON'S® baby bath products come with the extra gentle NO MORE TEARS® formula, which keeps your baby’s eyes safe. Warm water and the act of bathing tends to leave the skin a bit dry. Pat your baby’s skin to remove excess water, and follow it up with a gentle massage with JOHNSON'S® Baby cream or lotion. This will provide some much-needed moisturisation to your baby’s skin, and keep your baby looking and feeling fresh and healthy.